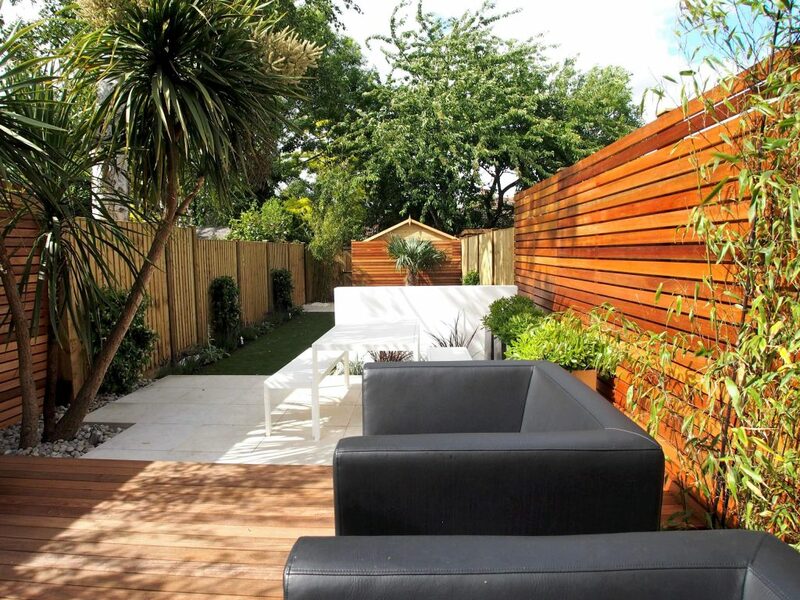 A long and narrow rectangular plot in Teddington, SW London was a design challenge. New bifold doors now lead seamlessly from the kitchen / day room out to a raised hardwood deck area and weatherproof armchairs for lounging in the warm sun. A step down to a second terrace area, this time done in porcelain tiles, provides the space for alfresco entertaining with family and friends. The back drop of a rendered wall defines the area and delivers the entrance to a natural looking artificial lawn. Elegant hardwood screens further help define areas and ‘hide’ the necessary garden storage and utility area!